For the month, August 2012, the Avid Baker's Challenge baking group is baking Glazed Apricot-Plum Galette from the book, The Weekend Baker by Abigail Johnson (at page 228). At this wintery season of the year, fresh stone fruits is never available in any of the Melbourne markets and all I can do to make these galettes is to use can fruits from the supermarkets! Living at the opposite part of the world, I reckon that this is the most difficult thing that I have to face whenever I am baking with Avid Baker's Challenge. Besides, I'm feeling a little exhausted too, keeping up with all my baking commitments and have decided to withdraw myself from Avid Baker's Challenge for this time being. Sad to say that this will be my last Avid Baker's Challenge post but glad that this recipe has worked well with a nice and humble can of peaches. This recipe is mostly adapted from the book, The Weekend Baker by Abigail Johnson Dodge. Briefly, the following points are the modifications that I have made from this recipe. Using half amount of this recipe, I've rolled my dough to a 26 cm diameter round in between two sheets of baking papers. I didn't pre-chilled my assembled galette before baking. I used milk to brush the galette before baking. The galette was baked at 180°C fan forced for 35 min. Both juice and gelatine were mixed together and microwave in high power for 20 sec. Wait for the glaze to cool slightly and then brush it over the fruit. The galette will look nice and glossy after applying this glaze. 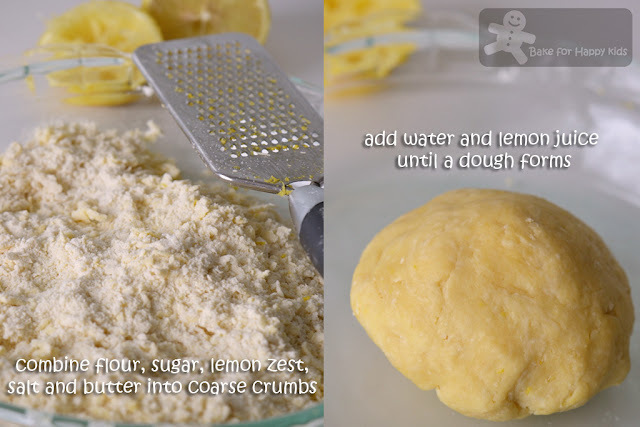 This post is linked to Avid Baker's Challenge (August 2012). To see the other ABC members' bakes, please go to ABC site. If you would like to join ABC , please contact Hanaâ. It's unfair to torture me with such a gorgeous photo. This looks delicious! Your post just reminded me that we are having opposite seasons! This is beautiful "wintry" dessert. Love, love apricots. 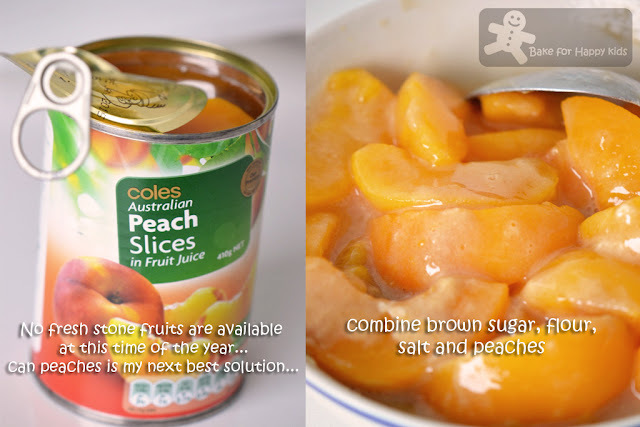 Fresh peaches are hard to find in Singapore, so I am very thankful for canned ones too... it does taste very lovely with baked goods. Your pie looks really delicious and lovely. Sorry to hear that this would be your last ABC post :-( Hope you can join in again soon! 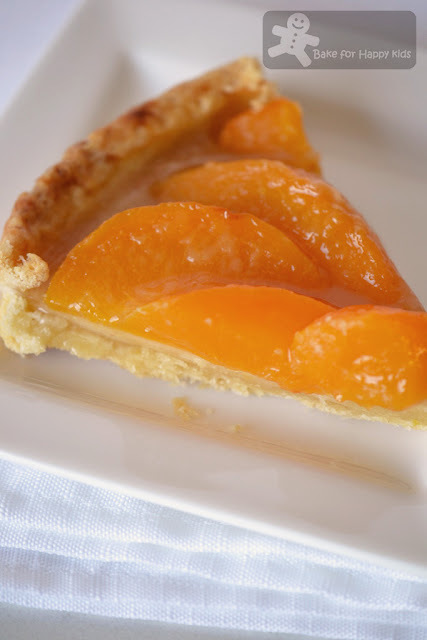 Anyway, your Peach Galette looks wonderful and I like that you used canned peaches! Seem like you have very good quality canned peaches over there as ours are so tender that they would get crushed upon the slightest handling. 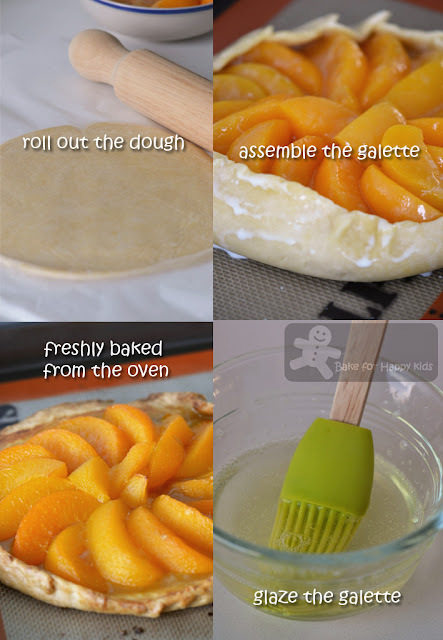 Very lovely peach galette. It is easy to get fresh peach in our place. Beautiful galette. I also made a peach tart last week. We are getting lovely peaches here this time of year. This is so beautiful!! Perfect match for an afternoon tea with coffee!! Same here, sorry to hear you can't do it anymore. The seasonality of fruit is an issue, though. I was glad that for some reason we had apricots in the supermarket much longer than usual, and I was worried that I wouldn't get them to ripen properly. 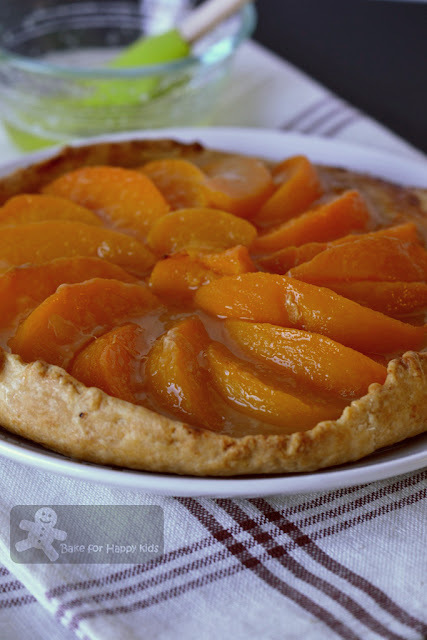 Your galette looks very nice, and canned peaches or apricots taste very good. Plums are a different animal - you never get them preserved in good quality. Hope you will be back at some point! Your galette looks beautiful. Great to know it works well with canned fruit. I like your tips of using a mixture of juice + gelatin to make the glaze shiny and have it remain shiny. Will remember that!! This recipe is amazing! Great blog! Canned peaches are actually really delicious! I love peaches,the color tell it all,fresh and YummY !! This is one heck of a curtain call! What a beautiful galette to farewell the ABC's baking group! Your galette looks yummy! I thought of using canned apricots since I cannot get any fresh plums, but decided with all mangoes instead! Just as Hanaa says, hope to see you with ABC again. Enjoy your weekend! Hi Zoe. Wow, you have been baking up a storm so I can see why you're burnt out. I'm glad your listening to yourself and taking a much needed break. Your pastries always look so perfect and this one is no exception. Happy to follow you on Twitter and here! you have a great blog! Hi Zoe, your galette look delicious. Love the peaches, yum yum. hi zoe, using canned peaches looks just as lovely, i like galettes as i think they are rather simpler to form compared to other forms of pies or tarts! This is so wonderfully tempting, Zoe. Love the way you make the pie. It worked out beautifully with the canned peaches~YUM! Highly irresistible and super tempting galette. I haven't made a galette in a while. You've reminded me I need to! Yours looks amazing. Peaches are in season here right now so I need to take advantage of it for sure. I don't know why I don't bake galettes. It looks simple and easy to make. And oh it's weird of me but I always prefer peaches that are canned ones over the fresh ones. I get an itchy rush in the throat.. weird huh? haha that's me! Loving how quick and easy this recipe is. Would be perfect for my last minute family dinner dessert! Zoe, So happy to see that you persevered even though you couldn't get fresh fruit at this time of year - and your result is gorgeous. I love galette and this look awesome Zoe! I think you solved the summerfruit-problem perfect, it looks real yummy! Great looking dessert. Galettes always look so pretty, and they are actually fairly easy to do. Canned peaches actually have pretty good flavor, so they'd absolutely work in this recipe, IMO. Really nice - thank you.